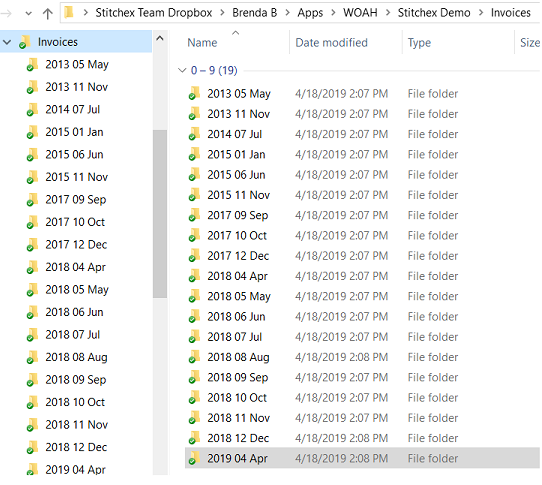 Stitchex integrates with the Dropbox cloud storage service to provide you with an automatically updated copy of all your generated PDFs within your Dropbox folder. All of your PDFs will automatically synchronize to your desktop computer or any other device linked to your Dropbox account. Navigate to Settings > Dropbox. Figure 2: Shows "Folders by Month"
Figure 3: Illustrates "No Folders by Month"
Note: All of these other subfolders (e.g. Linesheets, Deliveries, etc. are available in both "Folders by Month" and "No Folders by Month" views. The only difference is that the monthly subfolders are not generated. And, all PDFs are in one folder. 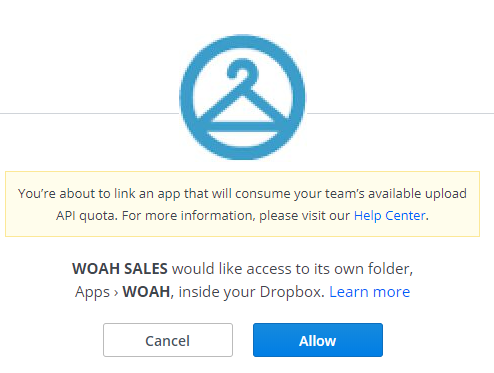 After clicking Connect to Drop Box (only on your first time), you will see this dialog box asking you to allow WOAH SALES to access (and create) a folder called "Apps>WOAH" inside your Dropbox. Please click "Allow". Stitchex will create separate folders for your Invoices, Sales Orders and Shipments. See Folder Structure below for additional navigation details. As you create PDFs in Stitchex, they will be automatically copied to your Dropbox account and you will notice them syncing with your other devices. If you are storing these on the "cloud" and not on your local hard drive (setting within Dropbox), all of your team members can see the documents. And, as an Administrator of the Dropbox, you can specify which folders your teammates can have access to. To remove the syncing of Stitchex from your Dropbox, click the "Disconnect" link as shown in Figure 3. You can easily "reconnect" as long as your Dropbox is still active.